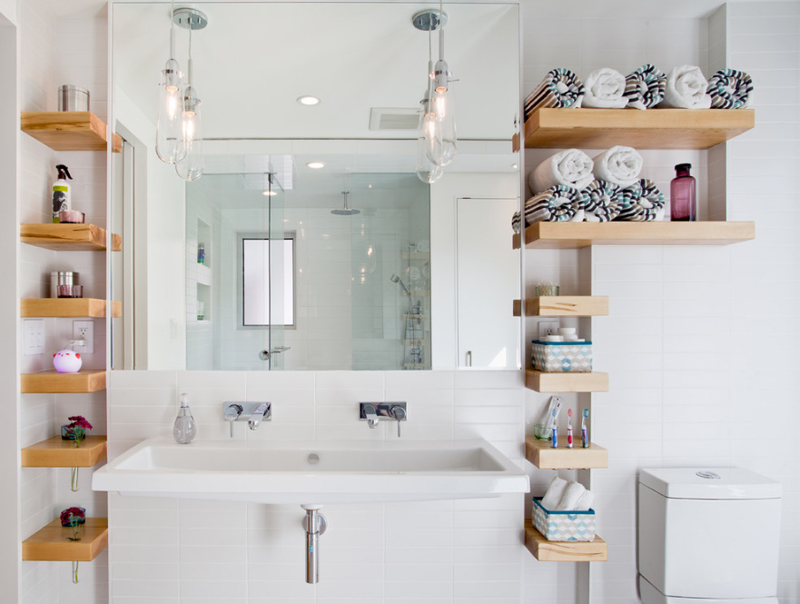 Check out how you can add bathroom wooden shelves. Most people are really particular with their bathrooms. Bathrooms are an essential part of the home and so gorgeous, clean, and glorious is what we aspire for when it comes to our respective bathrooms. Aside from sanitation, one important people consider is space in the bathroom and toilet. This is made possible by smart shelving and installation of cabinets. Shelves are essential and very practical for the bathroom because of all the necessary toiletries and stuff we need to use. 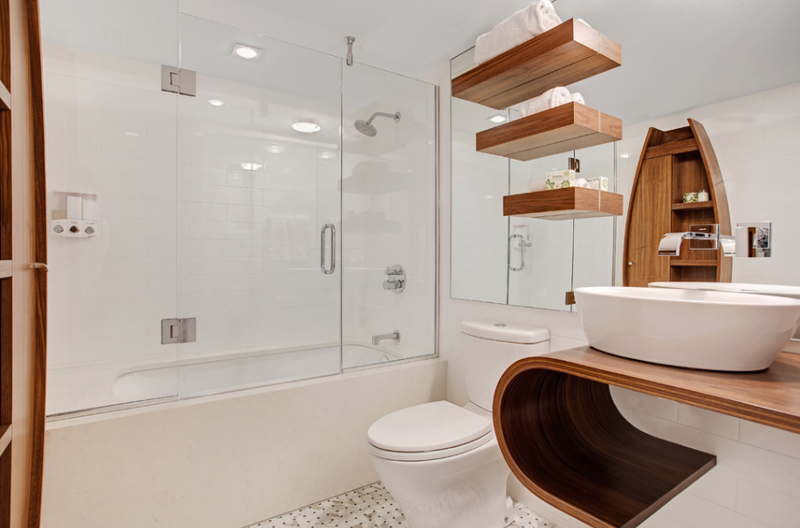 For some awesome inspiration, here are 20 amazing bathrooms with wooden shelving that might just be your next project in your own homes. 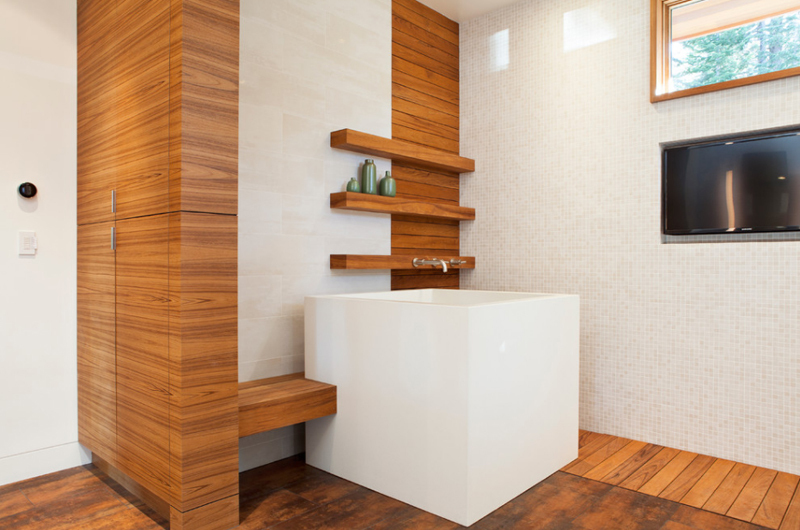 Since wood is very useful, straightforward, and accessible, these bathrooms and wooden shelving can easily be materialized in your homes. Whether modern, rustic, or eclectic, wooden shelves are easy to work with and can go with varied designs and decorations as well! 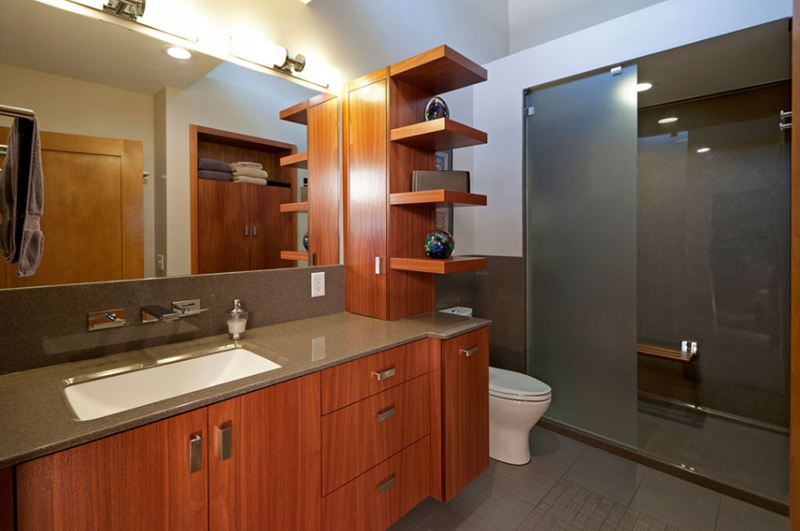 This bathroom has significantly incorporated wooden shelves and drawers within a small area. The white walls and sink look much better with the fusion of the brown wood. There is not much decor in this part except maybe for the pretty ornamental plant but since there are several small shelves, the practicality and usefulness level has been raised to a higher extent. This bathroom is going for a monochromatic approach which actually works nicely as made evident by the gorgeous energy from what small space we see of this bathroom. The wooden shelves are colored black so whatever color theme or motif you plan for your bath, using the same color for the tub and the shelves has definitely a good oomph factor. 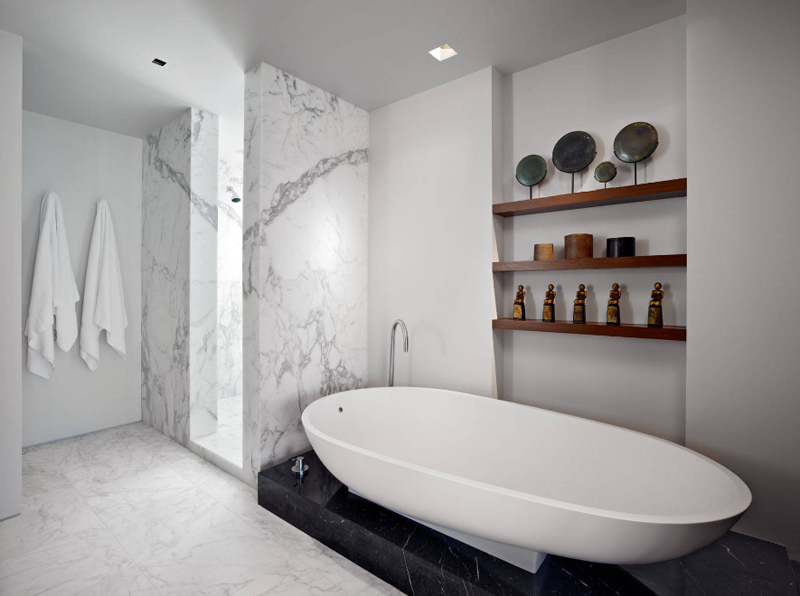 This bathroom is a luxurious one and the high-end lighting makes the whole space even a lot classier. 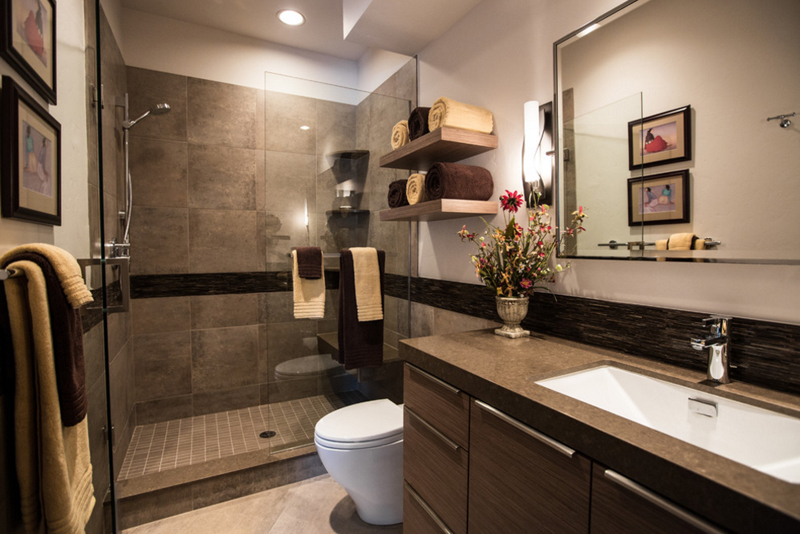 The light browns and beiges used are a really great go-to color when designing your bathroom. Moreover, another good feature here is the wooden shelves that neither wilt in style nor are overpowering the whole look. As usual, decors and skin essentials are really pretty up on a shelf. 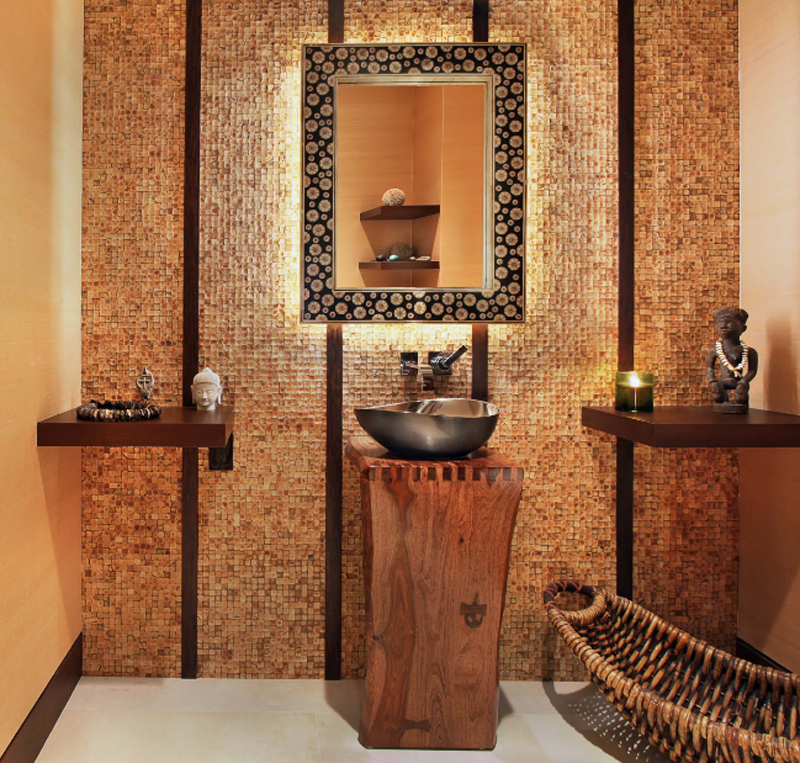 The motif of this bathroom are the light versus dark browns which kind of reminds me of caramel and chocolate. The granite walls and tiles are really stunning features of this bathroom and the shelves are really practical areas to put those contrasting colors of the bath towels. 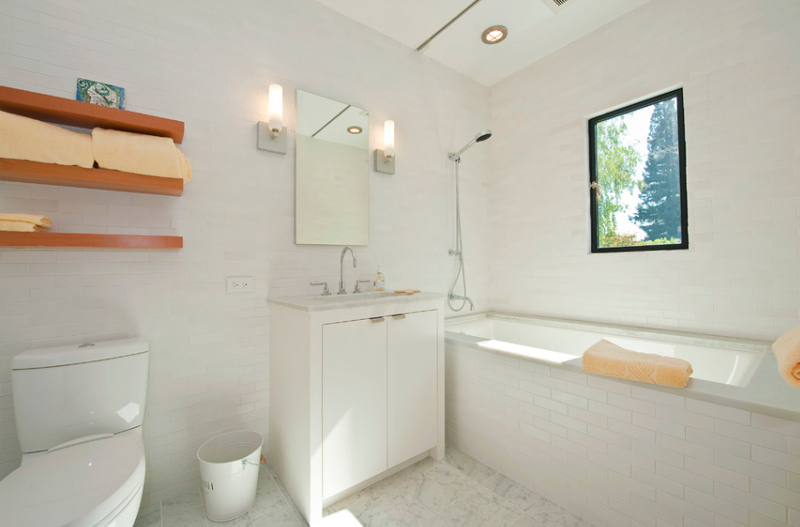 There are decors in the bathroom which add energy without being too overbearing. 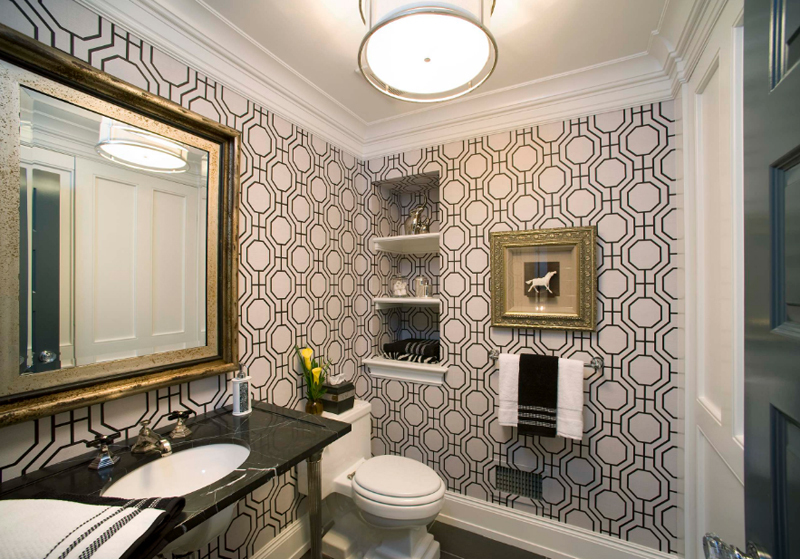 Here’s one really dainty bathroom which might remind you of old Hollywood movies in the 70s or 80s. The cabinet has a rustic feel and it gives a nice contrast to the white walls, tub, and shelves. This bathroom’s wooden shelves are also of the same color with the tub and the matching colors make the room feel light and somehow breezy. The small windows are a pretty addition to this area as well. This bathroom is definitely one-of-a-kind. There are several unique features in this bathroom and despite that, the bathroom does not disappoint but rather, it is gorgeous and pretty. 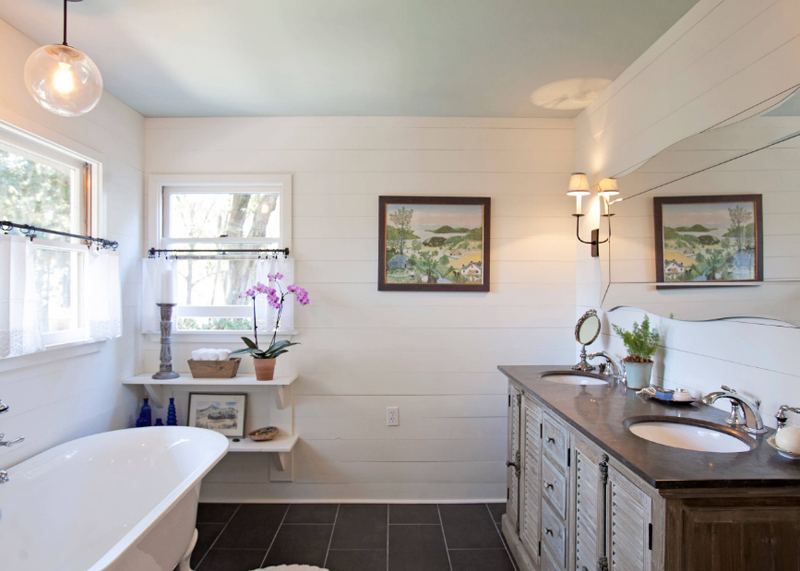 The white colors in this room go nicely well with the wooden features of the bath. Those wooden shelves as well, despite being narrow and slim, they add to the elongated effect and spacious vibe of the whole area. Here’s a pretty bathroom perfect for those gorgeous and classy hotels. 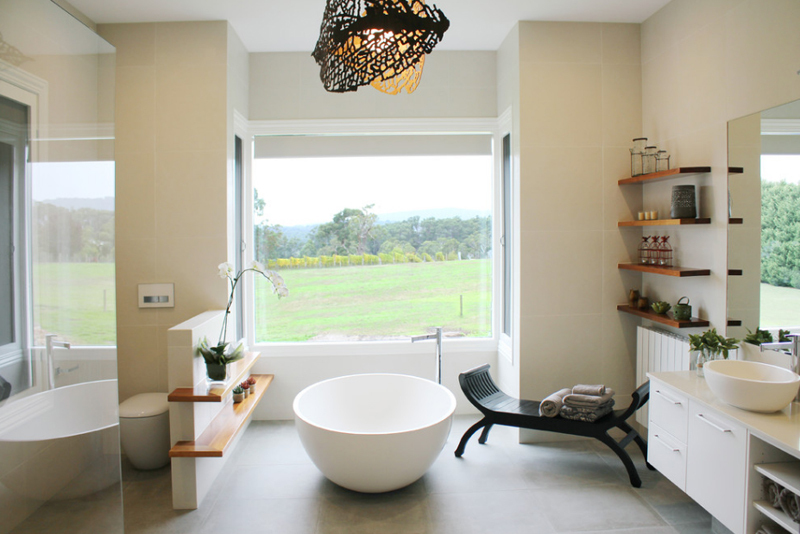 The area is straightforward and practical with great ideas for decoration and an even pretty tub to go with the whole gorgeous look. The wooden shelving is slim similar to the previous bathroom we featured, but these shelves are absolutely perfect for those mood-setting oils and candles. This bathroom is very modern in style and interiors. The dark grays and silver elements are highlighted well thanks to the stunning yet straightforward lighting. Even the tub is quite unique. The wooden shelves have various levels and are gorgeously assembled. They are definitely convenient for decor and bath essentials. 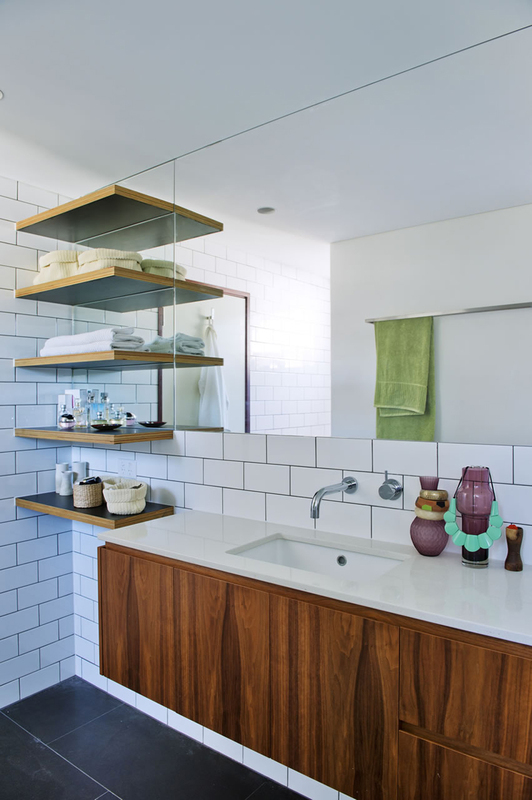 Wooden shelves are very practical and functional in the bathroom. If you need something for the aesthetics, they can easily be used to put up decor like marbled glass, scented candles, or perhaps a plant. If you want to put up a napkin container or a place for your soap stashes, then it’s also a great idea. The wooden shelves in this bathroom and toilet are small but definitely functional. The use of this color of wood is definitely a stand-out as well. This bathroom has gorgeous furniture and decor with unique shapes, colors, and styles. The wooden shelves are a pretty brown against the plentiful of whites in the space. The shelves are very suitable and are practical to put decors on it or bath essentials. The interior design in this bath is topnotch and the colors and decor are winners as well, but last but definitely not the least, is the dazzling view outside made possible by the huge glass windows. 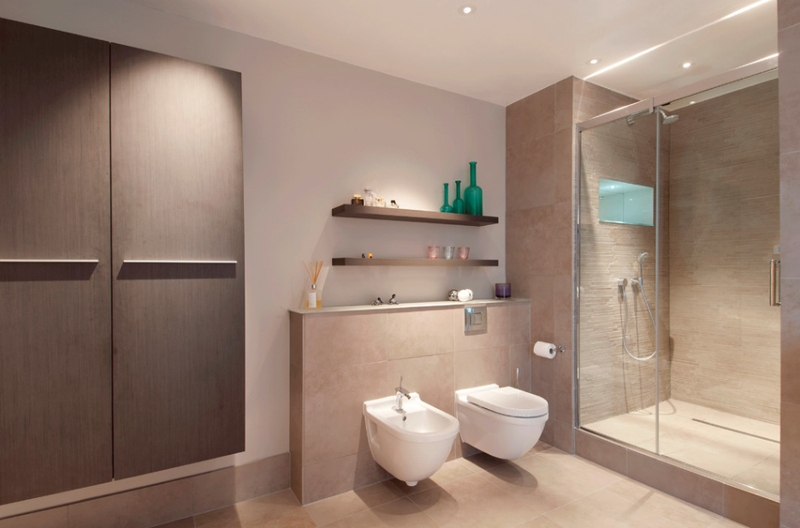 Here’s a bathroom that has been able to maximize and beautify a small condo bath and toilet. This is a proof that even small spaces can appear striking with the help of material and color choices. The style on the granite tiles is really exquisite and unique. The dark glass partition by the tub is also lovely. Lastly, the wooden shelves in this bath are of an attractive shade of brown that contrasts nicely the white sink, toilet, and tub. The extensive use of white is actually refreshing. This bathroom appears spotless and dazzling. The wooden shelves serve as a good color accent to this bathroom as it contrasts the big percentage of white in this bathroom. Here’s a unique bathroom with nice geometric patterns on the wall. The wooden shelves are flushed onto the wall and putting the same patterns inside the shelves is actually impressive. If patterns might be too much for you, then using minimal decoration in the bathroom might do the trick and you can just put up what is essential. The wooden shelves in this bathroom boast of great decorations. The use of browns and dark-colored decor is a good accent to the otherwise white bathroom. 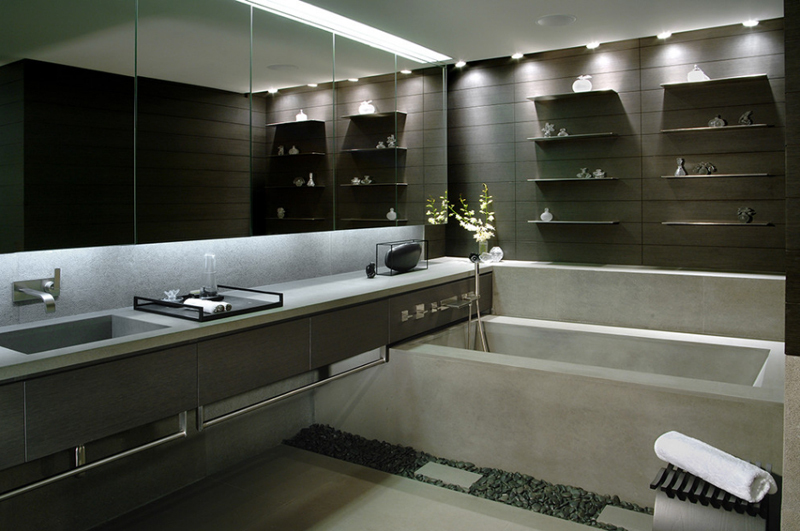 The tub is unique and looks great atop of a black granite block. 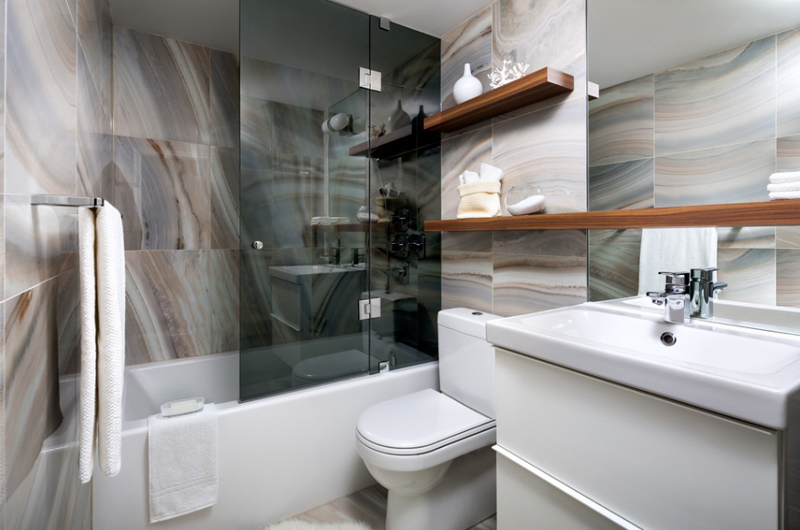 The marbled wall that leads to the shower is also a good way of accentuating the bathroom. One word for these wooden shelves: functional. These wooden shelves are very practical and are helpful in displaying decors and bath essentials like soap, towels, and bath creams. They are also a great yet light shade of brown to contrast the white walls, sink, and toilet. The lighting fixtures in this bathroom are also amazing. Here’s one definitely unique bathroom. The play of different shades of brown is dazzling and absolutely exquisite. 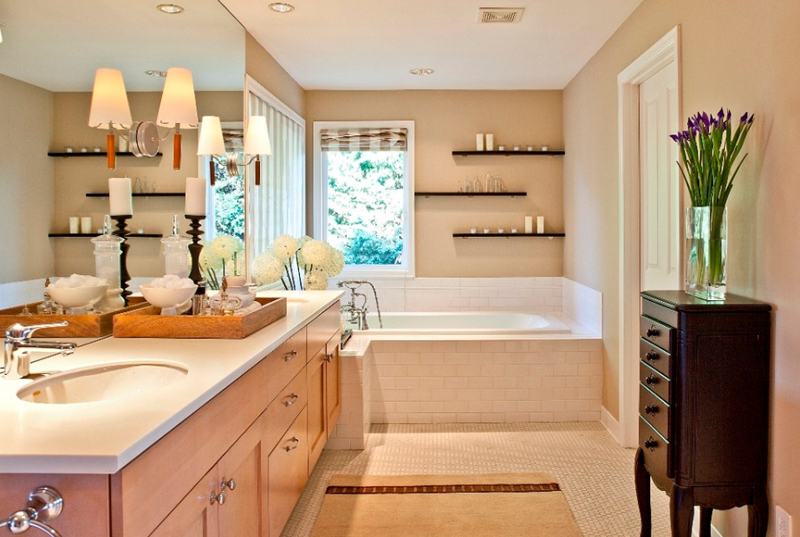 The wooden shelves are perfect for striking decors like the ones used in this bathroom. The walls and the mirror frame and generally everything that we see are just absolutely magnificent and one-of-a-kind. The lighting fixtures in this bathroom are gorgeous and really elegant. The double mirror creates a spectacular effect which is actually impressive. The wooden shelves are quite small but they are still a perfect addition to this whole area and the shelves are definitely practical. This magnificent bathroom boasts of unique furniture and furnishings. The use of wood cabinets and shelves, and even the uniquely curved counter create a perfect distinction from the more modern features and elements of the bathroom like the glass doors, mirrors, and tiles. Nonetheless, the whole look is breathtaking and the varying sizes of the shelves, and the uniquely-shaped cabinet and counter, create that one-of-a-kind feel to this one-of-a-kind bathroom. Here’s a simple and straightforward bathroom. The use of wood is a good way to juxtapose it with the white tiles and walls. The shelves are sufficient since there are five of them. And depending on the bathroom or the needs one have, loads of shelves equal to loads of function. Last but definitely not the least on this list is this bathroom. The decor and furnishings are unique and the shelves have done a great service for the display of various decorations. 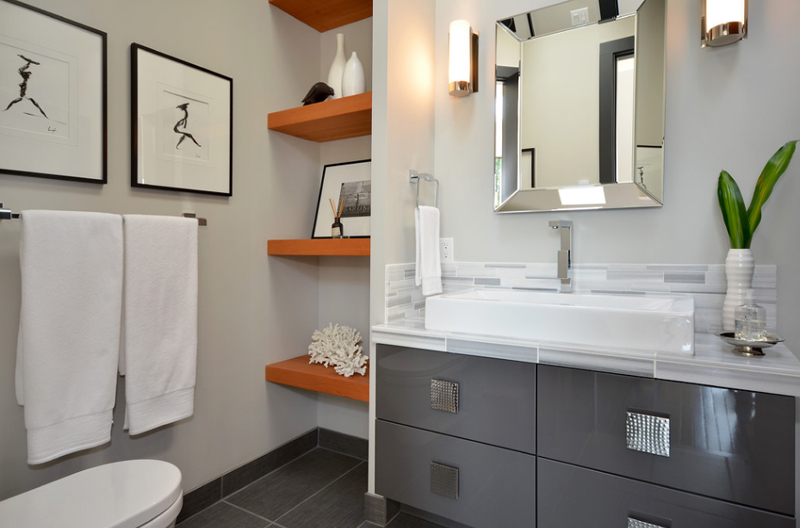 The use of color orange wooden shelves is a good accent to this otherwise white and silver bathroom. This is actually something you might want to consider when you are decorating your bath or toilet. 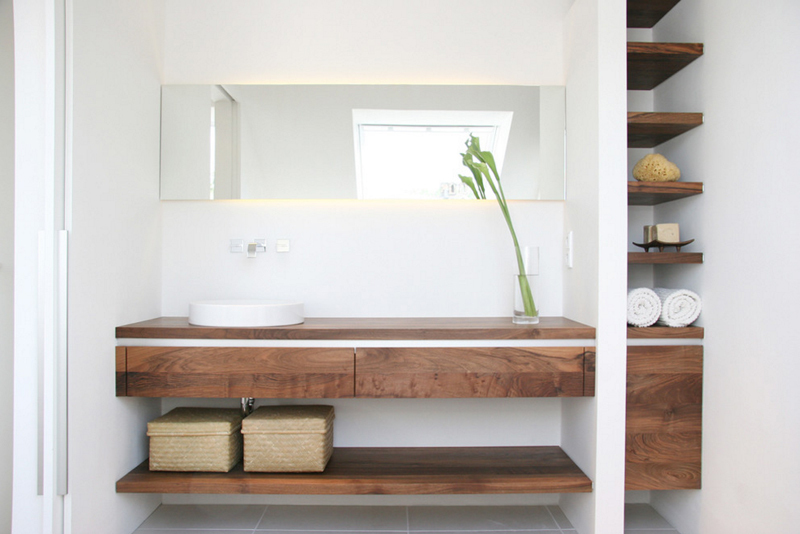 Wooden shelving is a great idea for the bathroom! It may serve both aesthetic and functional use for your decorations or bath essentials. Whether your bath is huge or small, whether it is rustic or modern, wooden shelves are very flexible and can go with several styles and designs. 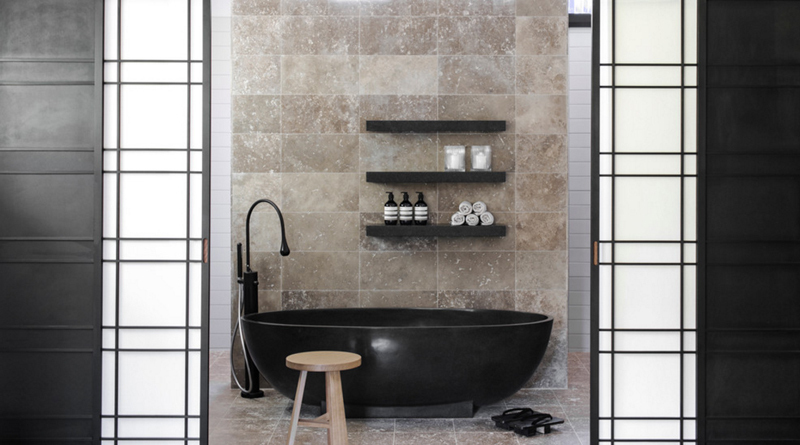 Take a look at this list for another shelving inspiration in the bathroom 15 Bathroom Spaces with Glass Shelving.